A Facebook post by a local man on teaching his daughter a lesson after she was kicked off the school bus for bullying, has gone viral. 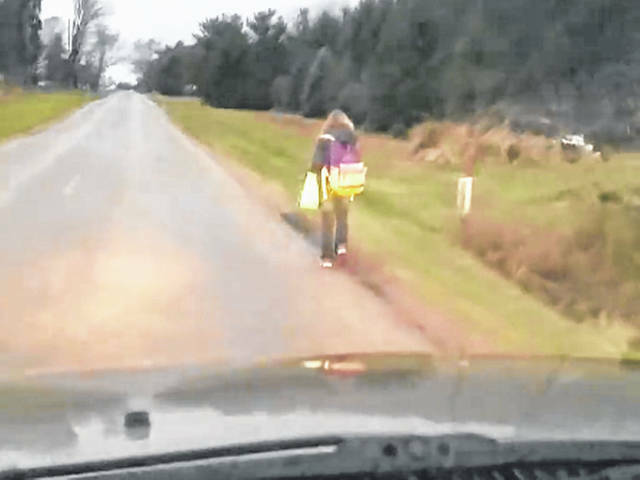 Matt Cox, of Swanton, posted a video of his 10-year-old daughter walking to Evergreen Schools on Monday. He’s following behind in his truck, commenting as his phone records. The sixth-grader trudges deliberately along the road, her purple and orange backpack bopping on her shoulders, as Cox explains the situation. He’s making her walk to school — 5 miles — after she was booted from the school bus for bullying another student. As of Wednesday, the post had 11 million views, 309,000 shares and 83,000 comments. It has been picked up by many news organizations, including ABC News, USA Today and BBC News. “Friday, my daughter came home, and for the second time this school year, said she had been kicked off the bus for bullying,” Cox said. Cox said his daughter felt she was “entitled” to a ride, and he wanted to hold her responsible for her actions. “A lot of it for me is parents today don’t hold their kids accountable,” Cox said. “I think that’s a huge part of why kids act the way they do. He reluctantly decided to make her walk the 5 miles to school on Monday, the first day of the three-day bus suspension. On Monday, she walked 1.5 miles, on Tuesday it was 1.7 miles and on Wednesday it was 2.3 miles, he said. “The first day she was a little upset. But that evening, after I posted the video, we sat down as a family, and I was reading some of my comments,” said Cox, who also has a 15-year-old daughter and a 12-year-old son at home. Cox was asked if, in hindsight, he felt his discipline was too harsh. “Absolutely not,” he said, adding that this time of year, children are outside for hours when it snows, sledding and throwing snowballs. Cox grew up and went to school in Bowling Green. He said if he would have bullied another child, his punishment would have been a lot different than the one he doled out to his daughter.